Well, it has been a long time coming, but our two-man show "The Brothers Grimm: 200 Years and Counting" opens tonight in St. John's. We've performed the show in Ontario, Quebec and Alberta, but this is the first time we've performed it at home. I'm thrilled to be able to perform it this December, as this month is the 200th anniversary of the Grimm's now famous fairy tale collection, Kinder- und Hausmärchen. 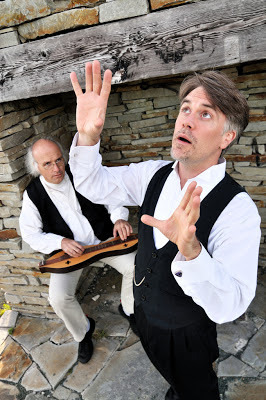 The show follows the lives of the brothers Jacob and Wilhelm Grimm, and their incredible true life story is interwoven with their stories, legends, and music of the period. We are running for two nights only, December 5th-6th, at 8pm at the Petro Canada Hall at Memorial's School of Music. Tickets are $20 and available at the door. Delf and I truly hope to see you there!